This page is about Operation Aquatint, a Small Scale Raiding Force's (SSRF) operation which took place on part of 'Omaha' beach, which, unbeknown to anyone at the time, would witness the largest amphibious invasion force in history just 21 months later on June 6 1944. There was, of course, no direct link between the two events but the accidental association serves to highlight this otherwise almost forgotten fragment of WWII... a fragment that helped lay the foundation of larger and more famous raids and landings to come. If you'd like to read about the setting up of the SSRF, its recruitment, training, equipment and modus operandi just click on the link. The Aquatint raid took place just 3 weeks after the disastrous Dieppe raid. German forces along the coast of France were on high alert following this raid and other night-time raids on Sark and elsewhere. The mission was to land on the beach near St Honorine des Pertes, a small coastal village near Port en Bessin, north of Bayeux. The Commandos were to land, record information of interest about the surrounding area, take a German guard prisoner and return to England. The SSRF group was taken across the channel in Motor Torpedo Boat, (MTB) 344, nicknamed the Little Pisser due to her high speed. She was 60 ft in length, one of the 'Experimental' MTBs built in 1942 and capable of 40 knots. When close to enemy occupied coasts, she could run fairly silently on auxiliary engines. She was armed with two 18" torpedoes, two Vickers machine guns and Lewis guns. Normal crew was 6 or 7. The SSRF men on board that day were Major Geoffrey Appleyard (Photo opposite), Major Gus March-Phillips DSO MBE, Captain Graham Hayes, Captain Burton, Captain Lord Howard, Lieutenant Hall, Maitre Desgranges (French), CSM Winter, Sgt Williams, Private Hellings (Dutch), Private Orr, a Pole whose real name was Abraham Opoczynzki and Private Leonard whose real name was Lehniger. He was a Czech from the German speaking Czech Republic's Sudetenland. During the raid Major Appleyard stayed onboard the MTB due to a badly twisted ankle, which he had acquired on an earlier SSRF raid. Also onboard were Freddie Bourne, the commander of MTB 344, and his crew. The final plan was to land in the St Honorine area, which had been clearly identified from aerial reconnaissance. There was a small group of houses on the seafront, thought to be occupied by Germans. These houses would be attacked and prisoners taken. 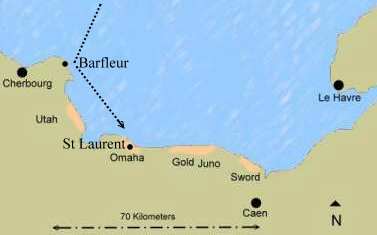 The coast around Barfleur was reached at about 2200hrs on Sept 12, in ink-black foggy conditions. They navigated towards St Laurent at a distance of 4 miles from the coast to avoid mine fields and at a reduced speed of 12 knots (21 km/h) to avoid detection from the main engine noise. In considering their immediate plans, March-Phillips asked what sounded like a rhetorical question.. 'Shall we have a bash?' The Commandos were about to land in front of St Laurent, about one mile to the right of their intended target. They scrambled into a collapsible boat, called a 'Goatley', that could hold around ten men. It was about 0020hrs as they headed slowly towards the right side of the valley indentation, later designated the ‘D-3’ exit from Omaha Beach at Les Moulins. They beached at approximately 0030hrs, just after a bright light was seen on the crest of the hill above. The Commandos considered their position for about 20 minutes when, at 0050hrs, pistol and machine gun fire poured down onto the beach from above and from the village. Grenades were thrown onto the beach from a closer position lighting up the whole area in flashes. The Germans attempted to bring a projector light down onto the beach to provide illumination. Canon fire from a more distant location to the west, joined in the mêlée. For half an hour sporadic fire continued to pepper the beach. It was a chaotic situation with much noise, running around and gun-fire from many positions in the black of the night. A German patrol moved forward to the beach front. Hall grabbed one of them and dragged him towards the Goatley, but another hit him on the head. At about 0120hrs, German gun-fire was directed out to sea, presumably because the MTB had been spotted. It was the only means of escape for the Commandos, who were now pinned down on the beach. Howard, who was guarding the Goatley, was hit in the leg by a bullet. As the Commandos scrambled into the canvas bottomed Goatley, German fire was concentrated on them. They struggled out to sea towards the MTB but the Goatley turned turtle in the desperate conditions. Howard remembers holding on to the up-turned Goatley, along with André Desgranges, but everyone else had disappeared. At the back of the beach there was a shingle embankment which, according to books later written about Omaha, provided good cover. It's not unreasonable to assume that the surviving Commandos made for this area. Around this time a shout from the MTB was heard 'COME BACK!' Perhaps Appleyard had glimpses of the stranded men in the flashes of visibility. Someone from the beach was heard yelling back, but it was inaudible. Tom Winters, in Mike Langley’s book, stated that he shouted towards the boat at one point and remembered seeing Captain Graham Hayes swimming westwards, away from them. The beach was covered in a hell of enfilade from the right, from the left , from above and now from a German patrol near the road above the embankment. The whole beach became lit up in broken flashes, but it seems that the projector failed to work. Several mortar shells screamed over the heads of the Commandos in the direction of the MTB, now visible to the Germans, but none hit their target. The Commandos, stranded on the beach, made a desperate attempt to reach the boat by swimming out to sea, but to no avail. The MTBs anchor was raised at around 0130hrs and the two main engines started, to take the boat out to a distance of two nautical miles. It soon became evident that the transmission box had been hit by bullets and damaged. The engines were throttled down to reduce noise, in the hope that the Germans would believe the boat had left the area. No more sounds were heard from the beach and it was assumed that the Commandos had split up and headed inland to hide, as was planned in case of a failed landing. Ten minutes later, the boat headed back to St Laurent (St Honorine in the report), using the silent engine, to within one half of a mile. This position was maintained for 45 minutes but there was no noise nor sign of life from the beach, except for the occasional glimmer of light from the Germans on the hill... maybe attempting to repair their projector. At 0230hrs, heavy mortar and machine gun fire opened up on the motorboat as flares had made it visible from the hilltops above the beach. One mortar shell fell within 20 feet of the MTB, spraying it in a plume of water. It was now too risky to attempt any kind of rescue from the beach, so the motorboat pulled back again, this time to one mile. The raid had turned into a disaster. Eleven men had landed. None would return. Three were dead – March-Phillips, Lehniger and Williams. Two were seriously wounded (Hall and Howard) and four escaped. Two were captured unhurt. The official report on the raid included the usual chapter on 'Lessons to be heeded' for future raids and landings, to add to those taken from all previous amphibious raids and landings. The report concluded that "It is too great a risk to undertake frontal assault of enemy positions, even those reputed to be light". The enemy at St Laurent, appeared to have had prior knowledge of some form of attack. Mr Piprel, the owner of the Hotel du Casino at Vierville, a mile west of St Laurent, confirmed that his hotel had been requisitioned by the Germans. During the night of 12/13 Sept, many locals heard gun-fire and the sound of German boots leaving the hotel. The next morning, Mr Piprel headed along the coast towards St Laurent, in the company of a friend. Approaching the Villa Hardley, they were stopped by a German soldier, who ordered them to help move a body that was on the beach. The body was clothed in a British uniform, less the belt and boots. Farther up the beach, Mr Piprel could see the abandoned dinghy, resting on the shingle bank. Another body was visible to the east, opposite the Chemin des Fresnes pathway. Later that morning, Mr Scelles of St Laurent, remembers seeing three bodies laid out in front of the thatched villa on the coast road. It is there, on the sea wall, that a memorial plaque can be found for the Aquatint raid. The church graveyard, in the village of St. Laurent, is just a stone’s throw from the US WWII cemetery above Omaha beach, which contains 9,387 graves. Around 2 million visitors go to the US cemetery and surrounding area each year, but few know of the 3 war graves in St Laurent church graveyard. I have just read your very interesting description of Operation Aquatint. I would like to give you some information that might interest you. In your description you mention ‘The fate of Holling has never been established to this day’. In fact the Dutchman you call ‘Holling’ was in fact Jan Hellings. He survived - I am his son, living in England! Sadly, my dad died just over 10 years ago in South Africa. I know my dad escaped the German attack on their boat, possibly with one other, by swimming some distance. He was a strong swimmer and came ashore at a safe distance from their landing beach. Hiding by day and travelling by night, he made for the Spanish border but was captured by the Germans ending up in a POW camp, near the Polish border, I think. The only way that he survived was, I understand, because he was multi-lingual (like all Dutch!) and so was useful to the Germans for translation purposes. Towards the end of the war, with the Russians advancing, the Germans evacuated the Camp to ‘safely’ by vehicle, while the POWs walked. My dad nearly died, but was saved by the Brits and repatriated back to Britain and my English mum in Bournemouth. She nursed him back to health. They had met before the war at a dance when my dad was stationed on the south coast. They go married after the war. I was born in 1946 in South Africa! (see OPOCZYNSKI, ABRAHAM - the true family name ). Captain Hayes, made his way through the hinterland to a farm building in Asniéres en Bessin, some 3km from the beach. The occupant, Mr Masson, hurriedly contacted the Brunville family, who lived at the nearby chateau. Hayes was brought to the chateau, under the nose of a German patrol not more than 150 metres away. He was given nourishment and a change of clothes and his uniform was destroyed. He was then taken to a barn where he hid and rested. The Brunvilles made contact with Mr Humann at Juaye Mondaye. He knew a Mr Emmanuel des Georges, who lived in Pin, near Lisieux with his aunt Mme Septavaux. Such was the secret network of the resistance who hid the Captain in a safe house. Olivier de Brunville, explained to Hayes that he was to be taken to Bayeux, where a resistance contact (Mr Humann) would take him by train to Lisieux. 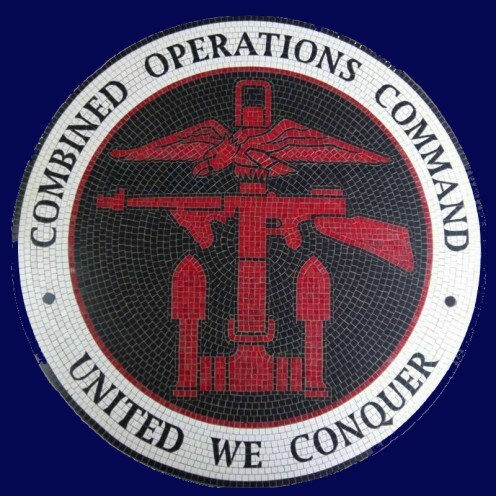 Humann, des Georges and Septavaux, all belonged to a resistance network called ‘Buckmaster,' a network working in liaison with the Special Operations Executive (SOE). 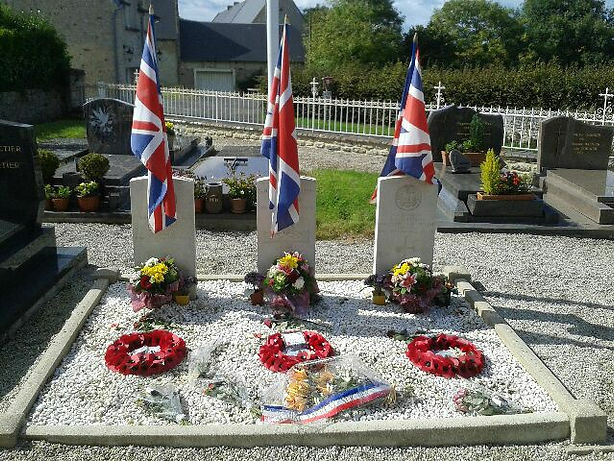 The resistance around Lisieux is said to have been particularly important, not necessarily in number, but due to the many groups that worked with either SOE, OSS or the Free French. On arrival in Le Pin, a small village near Lisieux, Hayes was taken to the house of Dr. Hautechaud. His daughter, Nicolle, remembers several British and American soldiers passing though the house during the war. After spending several weeks hiding in Le Pin, Hayes was taken to Paris. Here someone working by the enigmatic code of ‘ORKL’ introduced Hayes ever so briefly to a woman of English origin working with the resistance. Hayes was then accompanied to the Spanish border. At the end of Oct ’42, the English woman sent a message to London stating that ‘The captain is alive and well.' However, Hayes was barely over the border into Spain, when he fell into the hands of Spanish border guards, who promptly sent him back to the Germans. He was interned in the prison in Fresnes and Mr Humann and Mme Septavaux were arrested at roughly the same time. Back in St Laurent in Normandy, the Germans stepped up their investigations. Mme de Brunville, now working for the ‘Buckmaster’ network, had kept some of Hayes’ uniform as souvenirs. Following increasing house searches in the locality, she handed the mementos to Mr Haxo, whose house in Paris was later searched, though nothing was found. Mme Haxo burnt the remains of Hayes’ uniform to avoid further risk. Lacking any proof, the Gestapo released Mr Humann and Mme Septavaux. The Captain, under interrogation, had obviously not spoken. After the war, Mr Paul de Brunville received a letter dated18 January 1946 from Mrs Lilian Hayes, Captain Hayes’ mother. Mrs Hayes had learnt, that in June 1943, a British pilot had been captured and interned in Fresnes prison. He found himself in a cell underneath that of Captain Hayes. They communicated in Morse by tapping the plumbing in their cells. Hayes said little about himself, obviously not knowing for sure who he was communicating with. He had been part of a raid that had not proved successful, evaded the enemy until passing the Spanish border, etc. Following military investigation after the war, Mrs Hayes had been informed that the Captain had been taken from his cell and shot by firing squad on the 13th July 1943. He had been buried in a ‘special section’ in the cemetery at Ivry. Somewhere down the line, someone had talked. During Hayes’ stay in the house in Le Pin, everything had gone well... or so it seemed. Only a small circle of people knew of Hayes’ presence in the house. In Paris, Hugo Bleicher, head of German counter-espionage, had learnt from his mistress of a British officer hidden in a house in Normandy. Her name was Mme Marie-Suzanne Laurent and she worked in the Café Pelican in Caen. A traitor had infiltrated the resistance in Lisieux and passed the information to Mme. Laurent. His name was Robert Kiffer. He had been arrested by the Germans in 1941 near Cherbourg and threw in his lot with the Germans. ’Orkl’ was also a traitor and was later shot by the resistance. Kiffer himself was released by the French in 1949, following an appeal to his pending death sentence. He said he had been tortured by the Gestapo. According to the report of the trial, 'In 1943, Kiffer and others ‘decapitated’ the Norman resistance, leaving tears and mourning in their trail. Those shot or sent to the camps, will be too numerous to count." Kiffer had said of his work with the Germans; "I was made an offer one couldn’t refuse." Things began to happen after Hayes was taken from Pin to Paris, then to Spain. Two members of the resistance were found in woods, riddled by bullets. Doctor Hautechaud, head of the Lisieux resistance, was arrested and sent to Buchenwald, where he died. His wife was also sent to the camps, with no exact knowledge as to her fate. Hayes’ journey to Paris and beyond was being watched, and, of course, his turning over by the Spanish was no surprise. His capture was kept secret by the Germans for as long as Kiffer worked on deceiving the resistance. Kiffer said, in his trial, how he’d shown, everyone concerned, a letter from Hayes in Spain and that he’d heard a message on the BBC stating "The Captain has returned to safe harbour." Instead, the Captain was being held captive, before being shot. His remains were transferred, in 1951, from Ivry cemetery to Viroflay, near Versailles. Following ‘Aquatint’, command of the SSRF continued under the now Major Appleyard. Most of SSRF was, however, sent to Algeria at the end of 1942, where it made up an important part of David Stirling's new formation, the SAS. Appleyard, himself, was reported missing in action (MIA) in a flight over Sicily, while attached to 2nd SAS regiment. It appears that his plane was lost without trace on the very same day in July 1943, that Graham Hayes was shot in Paris. Henrietta March-Phillips recalled, in a BBC radio interview of 1971 entitled 'Looking for Gus', belatedly learning what her father had done in the war. She had grown up thinking that he was some sort of pirate! She had been too young to remember him. The rich diversity of the SSRF group, is best illustrated by the presence of Private Leonard, one of the three buried in St Laurent cemetery. He was Czech, but spoke German as his mother tongue, since he originated from the ‘Sudetenland’ - that part of Germany on the Czech/German border handed over to Czechoslovakia after WWI. Lehniger had come to Britain as a refugee from the Nazis. He had a Jewish mother, but was not brought up as a Jew. He had strong political commitments and, as was common in Central Europe at that time, he was a member of the Communist party. Less than a month before the fateful Aquatint raid, Lehniger had taken part in the Dieppe raid. On his gravestone, where the Commonwealth War Graves Commission leaves space for relatives to etch a personal message, those close to the man chose what was close to him……the closing lines of the Internationale... 'Die Internationale wird die menscheit sein.' (The International will be mankind). If I must die…From "Postmaster" to "Aquatint": the audacious raids of a British commando 1941-1943. Published in France by Gérard Fournier & André Heintz. €24/£16.50 ISBN 2915762058/ 9782915762051 or try the book link below for used books. Operation Aquatint was written by Nigel Stewart. He wrote; I am most grateful to Mike Langl ey for his advice and comments, André Heintz, whose warmth, enthusiasm and help were always welcome when the project needed input and Mrs Walters daughter of Private Lehniger/Leonard.